A 50th birthday calls for unique 50th birthday gifts. When it comes to milestone birthdays, turning the BIG 5-0 is most remarkable, most noteworthy, and the most outstanding in the passage of time. A 50th birthday is a time when many people take a sort of inventory of their life. Most will want to reflect a bit on the past and the friends and family who have shared their life journey with up until this point. Above is a custom-made 50th birthday wishes vessel - a cute and unique 50th birthday wishes idea! There's no question that your loved one's 50th birthday is an important occasion and that you want to mark it accordingly with a truly amazing unique 50th birthday gift. If you're shopping around for a special and unique 50th birthday gift for someone, you have a pretty sizeable task ahead of you. How do you go about summing up all of the fond feelings and well wishes you have for your friend or family member? How can you best convey all of the things you hope for them in their life going forward, and how can you show how honored you are to have been part of their life so far? It can be a difficult challenge: where can you find unique 50th birthday gifts? Another big problem you'll probably come across when doing 50th birthday shopping is that, by age 50, most people have accumulated a lot of stuff. So, you want to get them something that symbolizes your feelings for them, but the last thing you want to do is load them up with another well-intentioned – but needless – item. People are always trying to simplify their lives, and when it comes to gadgets and gizmos, a 50-year-old may typically already has everything they've wanted over the years. Often, birthday gifts given with love end up as superfluous items stashed away in a closet somewhere. Beautiful handmade art pieces almost always make a good gift, because they are unique and are something people typically enjoy displaying in their home. Still, though, these pieces are often not very personal between you and the one you give it to. A Captured Wishes gift vessel is not only a tiny work of art, but it also carries a very personal sentiment from you. It is your birthday wish brought to life. Even if your friend is a fashion maven or boutique junkie, it's unlikely that they've seen anything quite like Captured Wishes. Each is a delicate glass bottle layered with a crystalline rainbow of "magic dust" – each color symbolically representing a specific wish, draped with delicate heart-linked chains holding charms and tiny jewels – every last bit unique and unlike any other birthday gift which celebrates the recipient in such a personal manner. And to accompany this splendid little heart-warmer is a well written verse celebrating and interpreting the color and magic within. Capture the wishes you most want to give the birthday person within a fun and beautiful unique 50th birthday gift that will no doubt be treasured for a lifetime. The depth of meaning within the Captured Wish and your thoughtfulness in giving such a unique and personal gift will warm their heart every time they look at the magical vessel. This is THE Gift of 50! They'll also want to show it off. These fun, funky, chic, and unique pieces are one-of-a-kind and everyone who sees them wants their own – or can think of a person (or several people) they'd like to get one for. 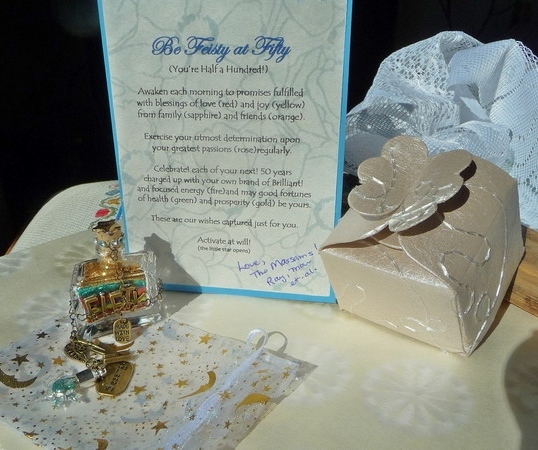 Once you've selected the Captured Wish you want to give to someone as a unique 50th birthday gift, it will arrive promptly – safe and sound, and ready to delight the friend and/or loved one you've chosen it for on their special day. It's not about the gifts, it's about the love. One of the best things about milestone birthdays is that we usually spend them with the people we care about the most – but if you can find a gift that will combine the memory of the milestone while at the same time capturing the moment and the emotion – why, you've mastered the art of chic and unique gift giving! When a gift can embody the love you have for someone and all of the blessings and good fortune you wish for them, it's a very special thing indeed. Check out our Happy Birthday Wishes page for more ideas!